Reference number for this case: 20-Oct-54-Saxi-Bourdon. Thank you for including this reference number in any correspondence with me regarding this case. NEVERS. -- Yesterday morning, ato 8:45, the bus Lornes-Nevers travelled in the direction of Saxy-Bourvon when the driver saw in the sky, through the windshield of the car, a mysterious machine. The bus stopped and the thirty passengers came out. The latter could then follow during a good moment the evolutions of a very bright disc which, after having taken height, disappeared behind the clouds. The two authors indicate that in Sazi-Bourdon [sic] in the department of the Nièvre, on October 20, 1954 at 08:45 a.m., the driver and about thirty passengers of the bus from Lormes to Nevers observed during quite a time the evolutions of a very shiny disc which disappeared behind the clouds after having taken altitude. The source is indicated as "Authors achive FP 70". The newspaper indicates that on October 18, 1954 at 8:45, a bus moved towards Nevers and crossed the commune of Saxi-Bourdon. The driver and his 20 passengers observed in the sky an object having the shape of a rugby ball, very shining and motionless at approximately 70 or 80 meters of altitude. It suddenly disappeared vertically at a vertiginous speed. The gendarmerie investigated into the observation. The newspaper says the sources are their October 21, 1954, issue, and that of "Centre-Matin" that same day. 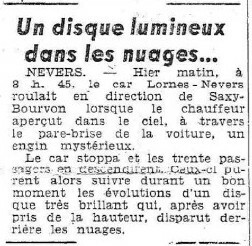 Luc Chastan indicates in his database that in the "Nièvres (58)" in "Saxi Bourdon" on October 20, 1954 at 08:45 hours, "the driver and about thirty passengers of the Lornes-Nevers bus observed during a good moment the evolutions of a very brilliant disc which disappeared behind the clouds after having taken height." The October 20, 1954, date, given in the ufological sources, is possibly incorrect, the correct date then being October 18, 1954. [lm1] Article in the regional newspaper La Montagne, Clermont-Ferrand, France, October 21, 1954. [---] Article in the regional newspaper Le Journal du Centre, France, October 21, 1954. [fr1] "OVNI, Premier Dossier Complet des Rencontres Rapprochées en France", book by Michel Figuet and Jean Louis Ruchon, Alain Lefeuvre publisher, France, pp 192-193, 1979. [jc1] Article in the regional newspaper Le Journal du Centre, France, page 5, November 3, 1997. 1.0 Patrick Gross March 24, 2009 Conversion from HTML to XHTML Strict. First formal version. Additions [lc1]. 1.1 Patrick Gross March 15, 2010 Addition [jc1], note on the date. 1.1 Patrick Gross October 10, 2016 Addition [lm1]. 1.2 Patrick Gross January 6, 2019 Addition [lh1].